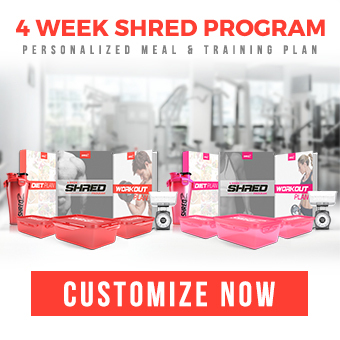 5 Best Meal Prep Hacks! Meal prepping, clean eating, tracking macros, or just eating healthier is not the easiest task, and certainly can be time consuming. Never fear – trending now are nifty kitchen tools that help make healthy eating quick, easy, and fun! But how do you choose? Options abound, but you only have so much precious kitchen real estate. Which actually work, which are more of a fuss than helpful, and which ones take longer to assemble and clean it than it does to actually use it and enjoy your meal? Avoid investing in kitchen gadgets that end up on the back shelf, collecting dust. 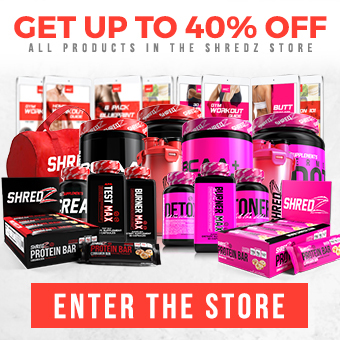 Check out these five winners, hand-picked by SHREDZ nutrition experts. They are perfect for any health food newbie to create delicious, quick, and healthy meals, and become a wizard in the kitchen to boot. Who doesn’t like a giant bowl of noodles? 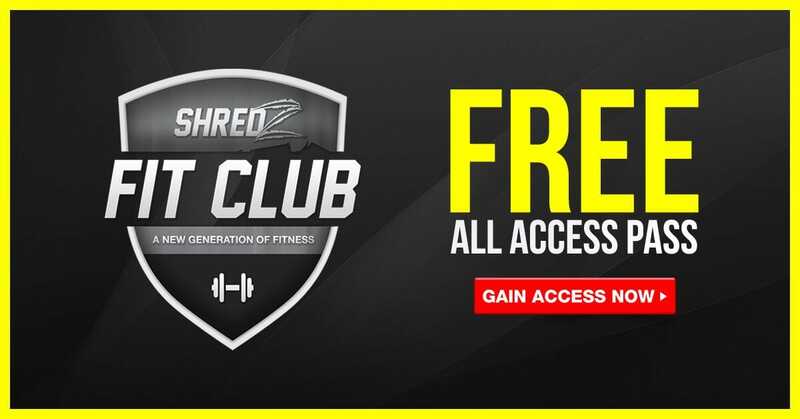 But it’s so easy to overdo… especially if you’re limiting carbs or watching calories. On the other hand, it’s almost impossible to overdo vegetables, a fundamental component of any healthy diet plan. Not only are vegetables packed with essential vitamins, minerals, and antioxidants to help you live longer and healthier, but they help keep you fuller longer because of their fiber and water content. And they have so few calories! You have to admit, though, steamed broccoli and lettuce salads are a real yawner. 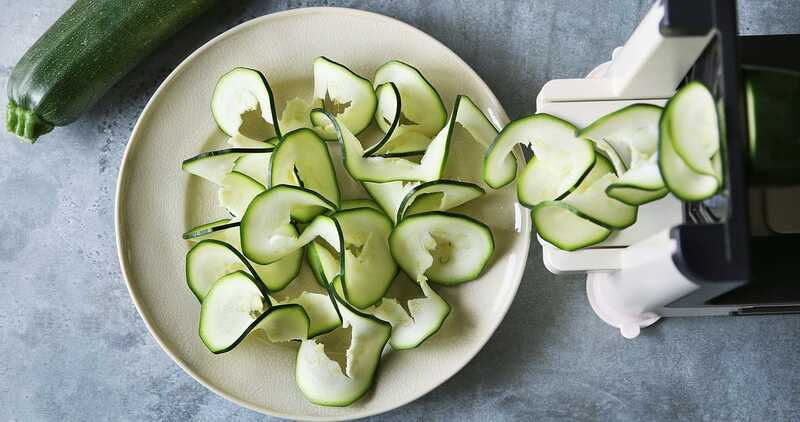 Enter the spiral vegetable slicer, which creates noodles – out of raw veggies! Who knew you could make noodles out of raw zucchini and other summer squash, beets, carrots, parsnips, sweet potatoes, butternut and other winter squash, bell peppers, broccoli stems, and cauliflower stems? Use a cup of cooked zucchini noodles instead of cooked spaghetti and save yourself 170 calories and 33 grams of carbs. You can substitute veggie noodles in pretty much any recipe calling for noodles (you will have to adjust cooking times). Get creative! Use your veggie noodles in cold salads; sauté them with red sauce, a meat sauce, pesto, or olive oil and garlic; put them in soups; toss them with diced and seasoned meat, poultry, seafood, tofu, or beans; steam and place (instead of rice) under chili, curry, stir fry, or stew; or get creative with casseroles. Not to mention, it’s an awesome way to get kids cooking in the kitchen and eating more vegetables! Check online for different brands and styles, and choose the one that’s right for your needs and budget. Garlic, a flavor- and antioxidant-packed bulb, is an essential ingredient in well-known dishes from all over the world, spanning across a wide variety of ethnic cuisines. It has been used medicinally for thousands of years, and is used as a natural “drug” to prevent cancer and cardiovascular disease, including heart attack, atherosclerosis, high cholesterol, and high blood pressure. It is also used to boost the immune system and clear up congestion. There is even some evidence supporting garlic’s role in suppressing appetite. Okay, so garlic is amazing for you but annoying to prep! Peeling and chopping garlic can be a difficult, time-consuming, and smelly task. 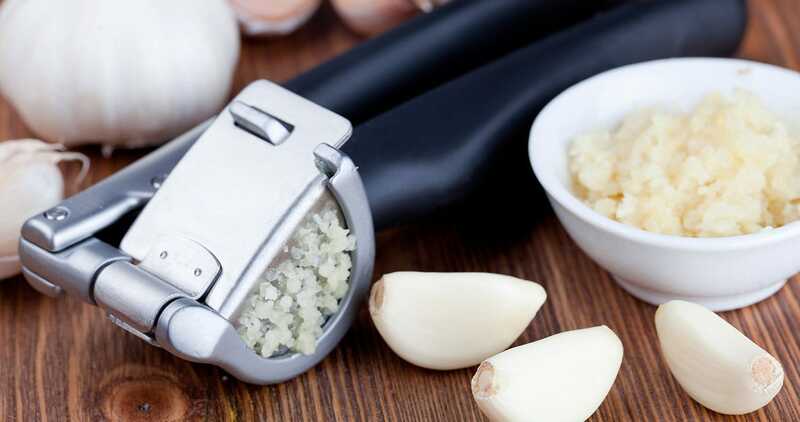 By using a garlic press, though, you can quickly have fresh garlic ready to add to your favorite recipes and to spruce up poultry, beef, fish, veggies, salsa, hummus, fresh tomato sauce, or a homemade dressing. Sauté freshly pressed garlic in olive oil and throw in anything from greens to beans, add a sprinkle of seasoning, and enjoy a quick dish that tastes like it was cooked by a pro. Look for one that also presses “backwards,” a handy self-cleaning feature. For best results, you should crush the garlic at room temperature and allow it to sit for about 15 minutes before using. That triggers an enzymatic reaction that frees up the healthy compounds in garlic. Even those who know their way around the kitchen don’t have always have the best knifing skills. Plus, a really good set of knifes costs a fortune! As it turns out, much of the work we do with a knife can be done more safely, efficiently, and accurately This with a good pair of kitchen scissors, or shears. 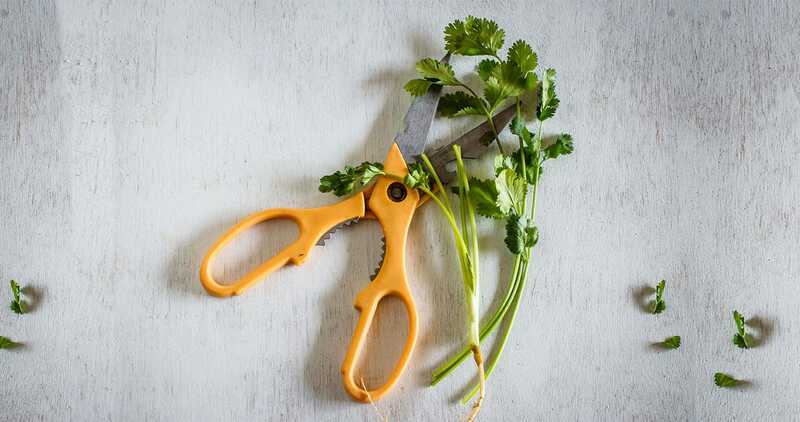 Your kitchen shears can be used to snip off the fat and skin from chicken and beef, prep meats for stir-fries, chop herbs, shred cabbage, devein shrimp, trim kale and collards, and cut up bacon. The best part -- they can be thrown in the dishwasher for easy cleanup. Keep in mind, though, kitchen shears are not the same as regular household scissors, and they should not be used interchangeably. And remember that it’s risky to cross-contaminate, so after completing a task with raw meat or poultry, wash the shears thoroughly with hot soapy water or run it through the dishwasher before using for other purposes. I know. Chopping veggies with a knife takes forever. And it makes a mess. Sometimes the time and cleanup commitment are enough to discourage using fresh veggies at all. Well, no more excuses! 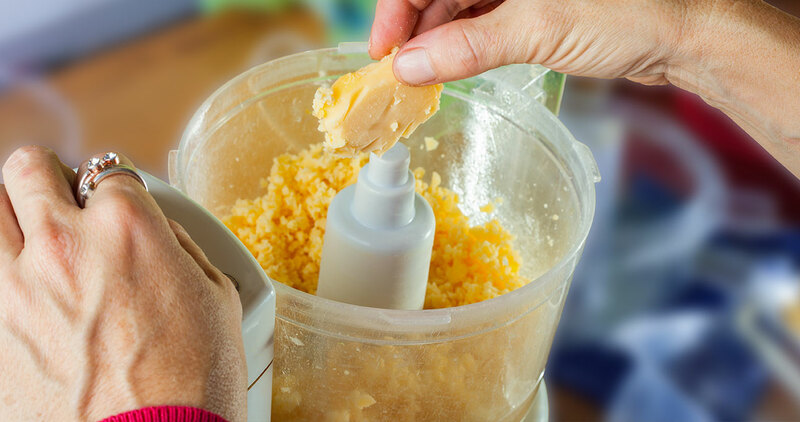 A handheld chopper or mini food processor will get the job done in a matter of seconds. Handheld choppers are great for evenly chopping small quantities of vegetables and fruits. Mini food processors chop everything up fast, but the resulting sizes of the pieces results may not be consistent or similar. And, you can chop up several different ingredients at once, super fast. If you process only a second or two (called “pulsing”), you get small pieces, but if you continue to process, you can make spreads, flours, “butters,” dips, sauces, pesto, dressings, and dough. Precise portion control is crucial when you’re following a healthy eating plan. 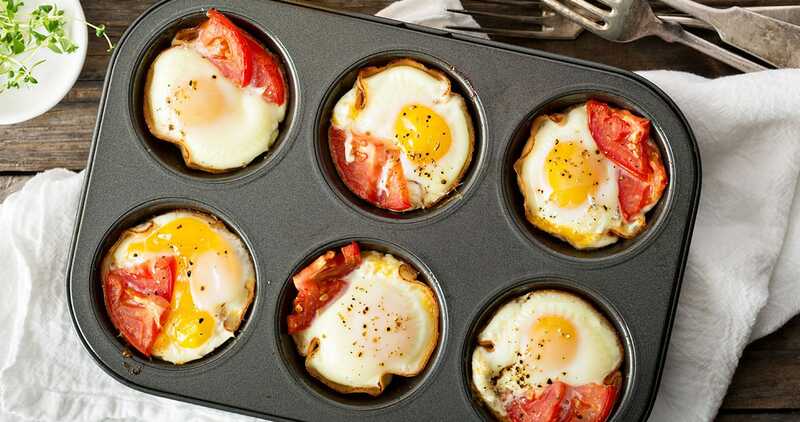 But it doesn’t have to be a complicated task: muffin pans (or muffin tins) are an easy solution for many recipes and meals. Use them to portion your meals and make single-serving mini meatloaves, egg muffins, mini taco cups, lasagna cups, baked oatmeal cups, baked potato cups, mini frittatas, mini pizzas, and, of course, muffins! This way you have everything portioned out right out of the oven, and you can easily store future portions in the fridge to grab and go during the week. Look for a high-quality pan that distributes heat easily. A non-stick surface is your best bet for easily removing your creations from the pan. These are just a few easy kitchen gadgets and tools to get you cooking quick and healthy meals. Of course, don’t forget about some of the basics such as a good wooden spoon, spatula, whisk, a heavy-duty sauté pan, and cutting board. Once you become more comfortable in the kitchen and know what types of foods you like to prepare, you’ll become a master of healthy cooking shortcuts, and maybe even have a little fun in the process.